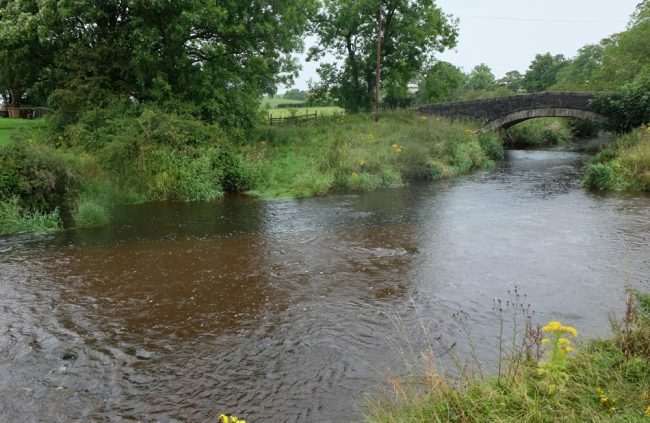 We commenced the Irvine timed survey last week (on 14th August) unsure what was happening with water levels. When we left the office last Monday morning, it was pouring and heavy rain had been forecast overnight. As it turned out, the river was at a nice height and we headed straight to Crookedholm and commenced the survey there. With around 20 fry per minute coming to the net, we were encouraged and looked forwards to more of the same as we progressed upstream. Sadly that wasn’t the case and when we fished the next site near Milton Dam, numbers had dropped to nearer 15 fry per minute. That’s not a terrible a result but we did expect better. We noted the Volga burn was enriched and wondered if this influences results at this site in an otherwise excellent fry habitat. The Galston road bridge was the next site on the agenda and it too failed to set any records with just over 10 fry per minute captured. 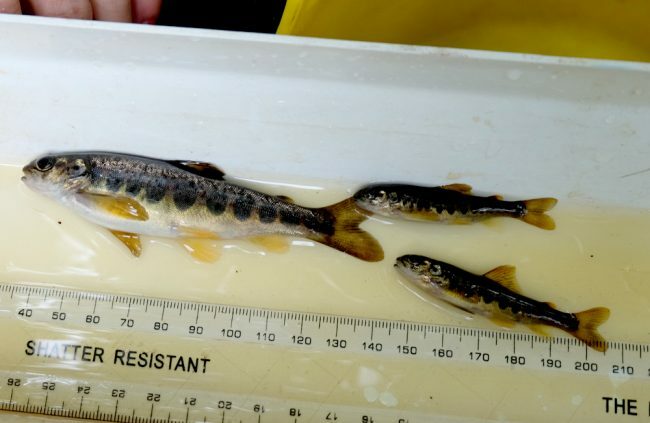 As salmon regularly spawn immediately upstream, we had expected slightly better results here. The next site upstream of Hagg Burn is also excellent fry habitat. This area produced the best result of the day with around 25 fry per minute captured.Continuing upstream, the Glen Water was surveyed high up and produced a result of just under 8 fry per minute. Considering the gradient between the site and the Irvine a couple of miles downhill, this may be a reasonable result for this wee tributary. It was reassuring to see that where there is access, salmon were spawning last winter. We dropped back into the valley floor and the Wee Irvine where rather than concentrate on the very poor salmon result of a single fry in this survey, we’d rather focus on the better trout numbers at that site. Of course we were disappointed but these surveys are only a snapshot in time and we have found many more salmon in this area previously. It does however raise a few questions that we will consider when we analyse the entire results. 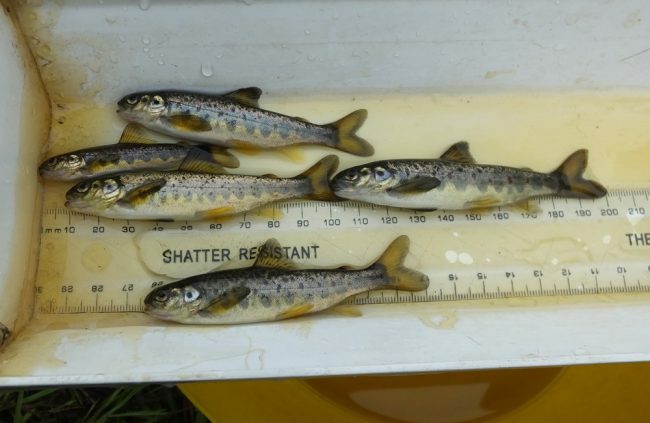 Finally we headed downstream to a site in Darvel where again, results improved with around 20 fry per minute were captured in the survey. Rain delayed the surveys and we didn’t managed back out until Wednesday16th of August when we found the Annick Water was fishable. Rain was pouring down and we feared we may soon get washed off but this was an opportunity we decided to take. We started far up the catchment near Braidland Farm, to the north of Stewarton. This wasn’t ideal habitat but is representative of what’s in this area. We managed 5 salmon fry per minute. Bearing in mind how far up the catchment this is, previous results on the upper Irvine and the habitat, this appeared to be a slightly disappointing result but nothing too concerning. Further downstream at Lainshaw just outside Stewarton, we fished 100m downstream of the weir, and expected to find better numbers of salmon. Our total of 11 salmon fry was disappointing to say the least. We noted silt laden water coming down the right side of the river and investigated the source which turned out to be a building site beside Lainshaw House where a machine was digging a pipe track. Both contractor and machine man seemed oblivious to the problem and the pollution they were causing so despite spending 10 minutes trying to explain what was wrong, we left them with no confidence they would take any notice and reported the incident to SEPA. Downstream of Chapeltoun at Water-meetings where the Glaisert and Annick merge, we hurriedly fished the site as the water was beginning to colour up (presumably as a result of the works at Lainshaw). Once again the results were disappointing and only 47 salmon fry were caught in otherwise excellent habitat. At less than 10 per minute, that has to be a poor result from here. 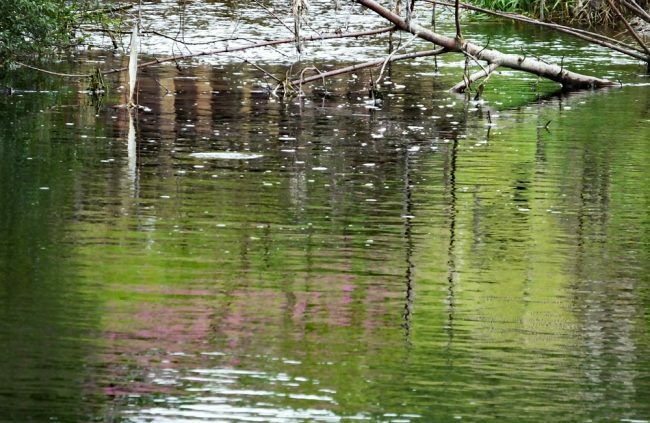 By the time we left the rain was again pelting down and the river was starting to rise but even so, the colour we put down to the contractors upstream rather than rainfall. The Glaisert was still running clear. The final site of the day was at Dreghorn next to the old cemetery. The habitat looked ideal with run and riffle and mixed substrates suitable for spawning. Ranunculus was throughout the site and offers excellent fish cover. There were a few nice trout around the 6 – 8″ size and we missed one a fair bit bigger ( it obviously felt the electricity and took off from afar splashing on the surface as it went. Salmon fry were again very disappointing at only 5.2/minute. However we did catch a huge salmon parr that we scaled and aged when we returned to the office. At 189mm long, it is the second largest parr we’ve ever caught (beaten only by one at 190mm from Kilmarnock Water). 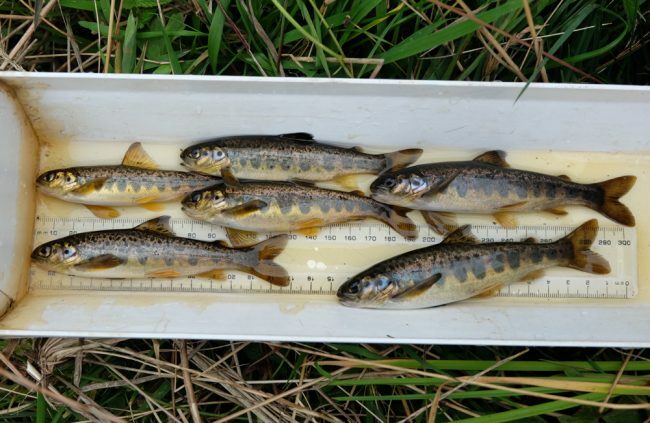 It was a 2+ year old fish which illustrates that these fish manage exceptional growth compared with other rivers in Ayrshire. The fry on the whole were very well to do with the largest captured measuring 103mm. Again, that’s a staggering sized fry for anywhere in Scotland. The trout we aged, were 2+ year old fish and naturally produced (not stocked). Rain brought water levels up and we abandoned the survey until today. This morning we mustered two teams, one for the Irvine and the other for the Garnock. Water levels on the Garnock were ideal but the Irvine was challenging but just fishable. 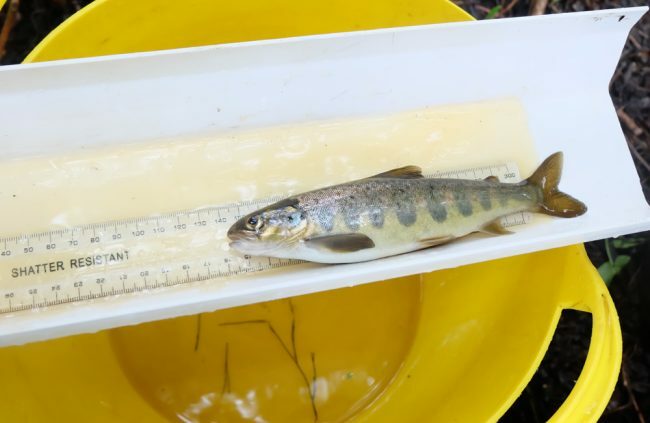 As the Irvine surveys progress downstream, the lower river results were on the whole disappointing with around 10 fry per minute being the best recorded. 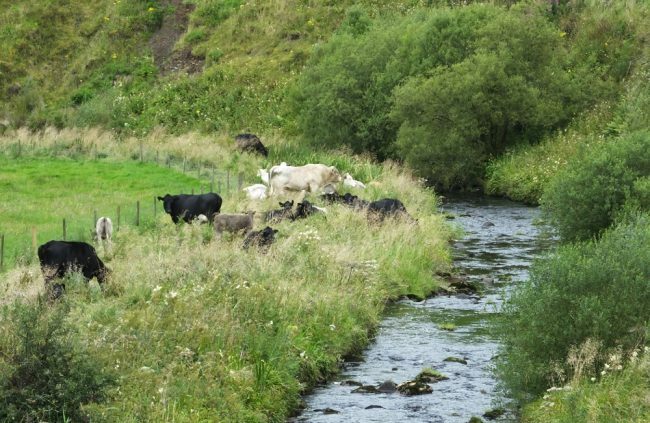 This isn’t uncommon on lower rivers in Ayrshire where the cumulative impact of sediment and diffuse pollution is felt most. Consequently productivity and is generally poorer nearer the sea. 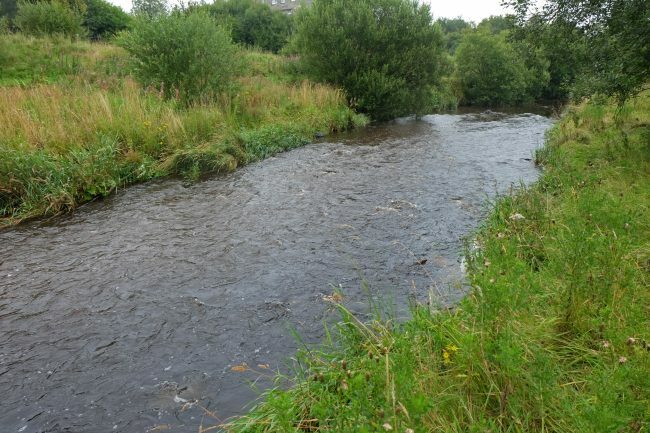 The Garnock was also poor in the lower river but this is probably due to a lack of spawning habitat rather than sediment and diffuse pollution. 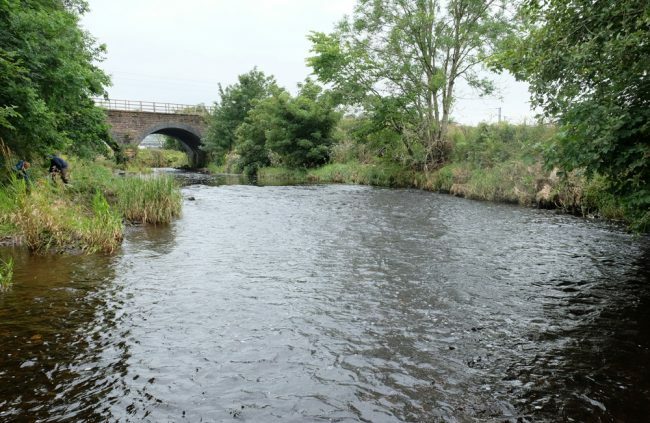 There are few suitable run riffles downstream of Kilwinning and most fish likely press on upstream to better spawning habitat. Beyond Kilwinning things improved quickly. The rail viaduct upstream of Kilwinning was slightly disappointing but it was still lower river and is probably only utilised for spawning by late running salmon. The best site of the day was at Dalry between the road and rail bridges where 35.6 fry/minute were captured. This is a good result anywhere. 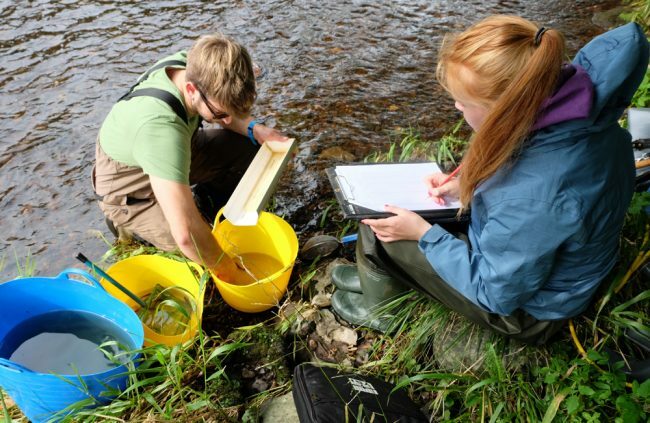 In fact it was the most prolific salmon fry site surveyed anywhere within the Irvine and Garnock catchments this year. 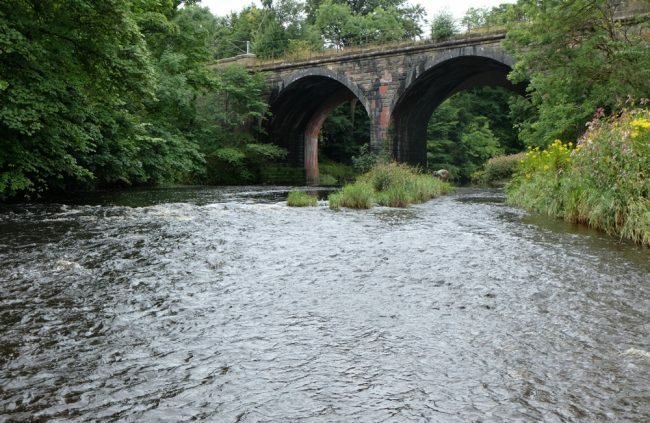 Between Dalry rail and road bridges produced the most fry of all the survey locations on the Irvine, Annick and Garnock. At Kilbirnie in the upper river, we found approximately 16 fry per minute and again judging by the quality of the habitat, we were slightly disappointed by this result although the salmon parr numbers were good and the condition of the parr was excellent. With so many parr and fry sharing the habitat, perhaps this explains why fry numbers were less than expected. The final survey site was upstream of Kilbirnie as the gradient sharply increases. The river becomes very bouldery and consequently we struggled to pick a good timed site for fry assessment but eventually decided on a suitable section of representative habitat. This was no way what we consider ideal spawning habitat yet the numbers captured were certainly good considering the limitations. The size of the fry in the upper site was noticeably larger than at the next two sites downstream that both produced greater numbers. This may be due to less competition for food or space. On the whole, (from this single series of results) it seems the mean fry average Garnock will be better than on both Irvine and Annick Water but until we’ve entered the data into the database and done the analysis, then we can’t be certain of this. The staff have enjoyed doing these surveys and learned masses about the productivity on these 3 rivers. Lets hope the anglers and clubs will repeat them in future as these data become increasingly valuable for management purposes with each repeat. I agree Stevie and we surveyed it just last week in the Town beside the Factory Discount store. The results confirm this is productive despite the habitat at the point we surveyed being modified and less than perfect fry habitat. It was a good parr habitat and both fry and parr were present on good numbers.